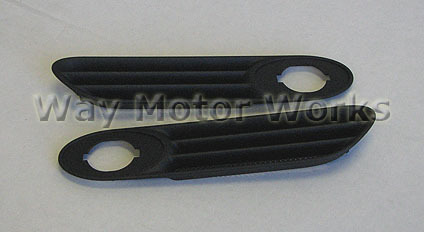 Black OEM MINI Cooper Side Scuttles or grilles for R50, R52, R53 MINI Cooper and Cooper S.
These black side scuttles originally came standard on the R50 MINI Cooper non S, but will fit all MINI Cooper and Cooper S cars from 2002-2006, and convertibles 2005-2008. Many customers have found they like the black look much better than the chrome that comes on the Cooper S. Giving your MINI a cleaner look. comes as one pair, enough for one MINI.